The ‘Freshwater’ aspect of the weekend focused on listening in on hydrophone arrays in several dams. For many participants, particularly locals, it was their first experience of this rich, aquatic soundworld. Recordings were made on site of the wealth of aquatic insects by Ros, Leah and other emerging sound artists. 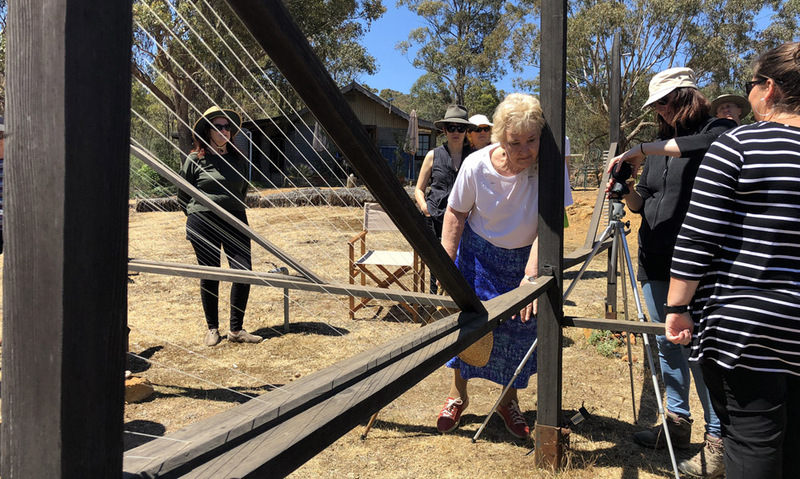 The Acoustic Sanctuary is also home to the original Mungo aeolian harp, which Ros had made in Redcliffs in 1989, and took to Lake Mungo with elders from the Mutti Mutti and Barkindji, Aunty Alice Kelly and her daughter. The magnificent instrument, now returned to her, is set up in a clearing in the forest, and had been restrung for the occasion. The Saturday was quite blustery, perfect conditions to get the aeolian strings singing in the wind, and visitors were treated to an organic concert from this unique sonic sculpture. Saturday also featured sound walks, short talks by Leah and myself, a panel of artists, and a video exhibition featuring Georgia Snowball dancing while listening for the first time to Vicki and Ros’s hydrophone array earlier in August. Plus much discussion, which carried on to dinner at a local pub. Then, on the Sunday, we resumed our listening, both aquatic and terrestrial. After lunch, we gathered outside the Fryerstown school, and prepared for something magical. The aquatic insect recordings (plus local frog recordings that I made twenty years apart) were woven together to form the sonic basis of an improvised concert. The recordings were live mixed by Leah, while Ros played her marvelous tarhu and Greek lyre, Vicki and Bridgid clarinets, and Megan; flute. Ros passed additional instruments and sound-making items around the audience, and various rattles, drums, murmers and frog percussives were injected into proceedings. Local poet Berni Janssen contributed short readings from her work, while someone angled a small harp ‘aeolian fashion’ to catch the occasional breeze and get its strings singing. The centrepiece was one of Ros’s sonic water sculptures, which dripped and splashed throughout, trickles of water ringing in musical ways off metal dishes. Ros’s only direction: “Do not overtake the water. Share the habitat”. 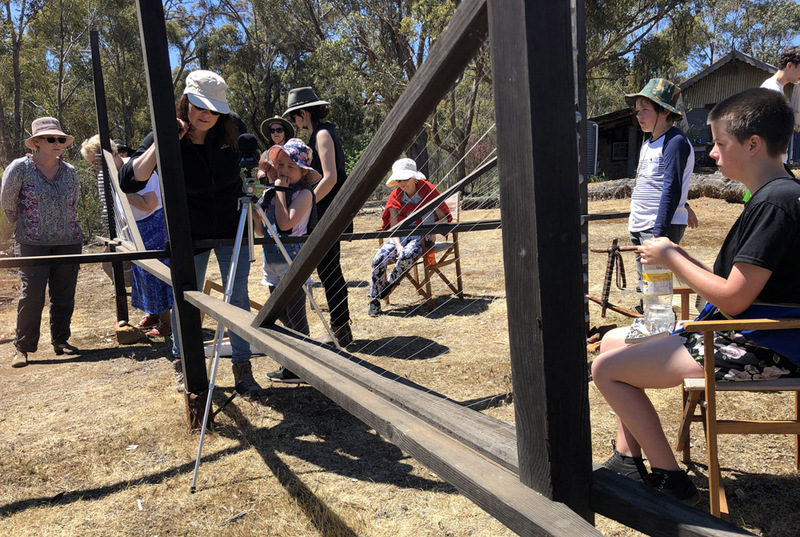 Meanwhile, the local magpies, weebills and pardalotes sung in the treetops, dogs barked, planes flew overhead and community life went on around us. I found myself reflecting that music is the state of listening and attention we find ourselves in – both performers and audience – during a performance. The usual attributes of music – melodies, lyrics, rhythms, a song, a score – are unnecessary in sharing this collective experience of deep listening and aesthetic engagement.